It is early morning, the sun has just risen. Nephra opens her eyes and sees that it is daylight out and she is filled with excitement as she looks over at her sister Zephra who is sleeping in her own bed just on the other side of the room. Nephra jumps out of bed and shakes her sister, "Zephra, wake up! wake up!" Zephra rubs her eyes and sits up as she asks, "Nephra for goodness sakes, what is it?" Nephra reminds Zephra, "C'mon we've got to get dressed, today we go and visit grandmother, remember? It's been such a long time since we've seen her last." Zephra rolls her eyes and plops her head back down on the pillow as she replies, "Nephra, that was no reason to wake me out of a perfectly delightful sleep." Nephra frowns and lowers her eye brows as she grabs Zephra's arm pulling her out of bed, she explains, "Yes, it is. I want to get dressed and go right away, I don't want to wait around on you all day." The girls get dressed immediately and have something to eat before they report to their father's throne to remind him of thier trip to visit their grandmother. Rin is standing near Sesshomaru when the girls request to go. Nephra asks, "Father, are you ready to take us to visit grandmother now?" Sesshomaru responds, "You both will fly with Au Un and Jaken to your grandmother's castle." Rin ask her husband, "Are you not going to take them?" Sesshomaru responds, "I will not be able to accompany them, I have much to do. " 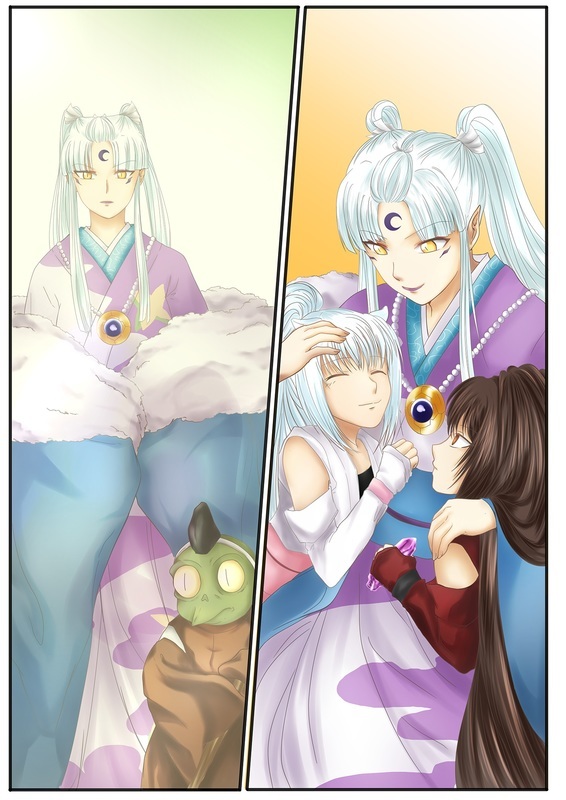 Rin is not happy with the idea of them taking the trip there with out him nor is she too excited about Sesshomaru's mother looking after the girls for the day. She tells Sesshomaru, "I hate the idea of the girls taking that trip to your mother's castle all alone, they're still just babies." The girls frown as they hear their mother call them babies but they continue to listen to their mother and father debate over the issue. Sesshomaru replies, "The trip is not so far. Jaken will be with them and he will allow no harm to come to our daughters" Sesshomaru glances at Jaken who is also standing near by as he continues, "Is that understood, JAKEN !?" Jaken jumps with fear as he responds in a shakey voice, "Oh, y-y-yess, Of course Milord." Jaken thinks: Oh, I dare not disappoint Lord Sesshomaru. If anything happens to the girls I will most assuredly die at his hands. Rin continues, " But what about while they're at the castle, on her grounds? She has all those odd portals that lead into other realms and dangerous demons roaming about. If anything were to happen to the girls she won't care. She's more likely to cook them and eat them than she is to protect them." Sesshomaru replies, "Rin, surely you are not suggesting that she is evil, do you recall that she generously summoned your life back from the Underworld many years ago? She has requested to see her grand daughters and so she will." Sesshomaru then instructs his daughters, "You both are to be well behaved at all times during your visit." The girls reply together, "Yes, we will father." The girls leave with Au Un and Jaken headed towards the castle and land where their grandmother resides. hmmm, my grand daughters are quite intriguing, their look and personalities are completely reversed. I believe I may want to put them through a bit of a test, just to confirm my suspicions. She interrupts their debate as she says, "Come girls, I want to show you something." They follow their grandmother to a huge field where there are dozens of odd shaped vegetables and weird fruit trees, she tells them, "These are demon fruits and vegetables, if a full human such as your mother were to consume any of these, she will become ill but you girls being half demon can enjoy them and may pick from them any time you would like." The girls are amazed at the huge field as Jaken runs directly to it and begins eating his fill. In the distance Zephra notices that there is something glowing brightly up ahead and she asks her grandmother, "What is that light over there?" Her grandmother replies, "It is one of the entryways we recently spoke of, that one opens to an area I call 'The domain of Flora' Nephra asks, "What does that mean?" She explains, "It is a hidden land full of various plant species. In there, I keep a huge,brilliant amethyst crystal that can be chiseled down to make gorgeous jewelry." Zephra's eyes widen as she is becoming very interested in this, their grandmother continues speaking knowing that her words will entice them, "I would have loved for you girls to have that amethyst stone, to furnish yourselves with lovely rings,brooches and pendants....oh, but I fear my dear granddaughters are simply no match for the dangers that lie within the Domain of Flora, Your lives are much more valuable than breath-taking crystal gems, so I beg you, stay far away from there." Nephra responds, "We will do as you say grandmother." Zephra remains staring at the bright light, too amazed to speak as she thinks to herself: I want to see inside that portal, I want that violet crystal gem. Their grandmother responds, "Very well girls, eat and enjoy the garden of demon fruits and I will return shortly." She disappears morphing into a ball of white light, leaving the girls to ponder the situation. Nephra sees Jaken has eaten his fill as he lies on the ground, holding his full belly while sleeping and snoring loudly. She immediately goes around the garden attempting to see what demon fruits and vegetables look good to her when Zephra stops her and asks, "Did you not hear what grandmother just said? Aren't you the least bit excited about that beautiful stone gem that she said we could have?" Nephra responds, "She told us to stay away from there." Zephra replies, "C'mon what could possibly be so dangerous? Whatever's in there we can fight our way through it and she'll be impressed when she sees we were able to get the crystal with ease." Nephra is determined to behave as her father told her to, "No way Zephra, I'm staying right here just as father and grandmother instructed." Zephra disappointed says, "Fine, I guess I'll have to go alone, I just can't walk away from that stone and all the beautiful jewels we can have made with it." she begins to walk toward the door, Nephra watches her sister step farther and farther away when she finally decides to run and catch up with her as she yells out, "Zephra!!!" Zephra stops walking and turns toward her sister, Nephra continues, "I can't let you go alone but if we get in trouble, you're taking the full blame." Zephra responds, "Okay, I'll take your punishment and mine. Let's go." The girls walk closer and closer to the bright light that is the gateway to the domain of Flora and they notice it is a huge door that resembles a huge golden leaf with handles on it. Zephra touches the door and it feels like tin, she proceeds to open it as she and Nephra can see a forest full of greenery, leaves, trees and plants everywhere. Zephra and Nephra begin to walk in and the door shuts behind them. Once this happens their grandmother reappears as she was able to see and hear everything in her invisible morphed state. She goes over to wake Jaken, poking his full belly with the tip of her foot causing him to sit up frightfully and yell, "Ah, Uh what's going on?!!" Sesshomaru's mother replies, "You are not a very good guardian." Jaken is confused, "Huh?? What do you mean Milady??" She continues, "The girls have gone off into one of my portals in search of an amethyst gem, They are risking their lives this very moment." Jaken's eyes pop out of his head and his mouth opens extremely wide as he screams in fear, "WHATTT!!!" he jumps up and runs in circles and babbles, "Oh no, Oh no, we've got to get them, Lord Sesshomaru will kill me, Oh...." Sesshomaru's mother interrupts, "Little demon, Calm yourself , we will watch their progress from here." She walks toward the large, golden leaf door and using demonic powers she turns the door to clear glass and is able to see the girls every movement though they can't see her or the door anymore. Jaken places his hands on his head as he cries, "Oh I don't think I can go through this again, I can't watch." Sesshomaru's mother ignores Jaken's crying as she thinks to herself: Of course I will not allow any harm to come to my only granddaughters but I would like to see how they handle themselves all the same. She looks at Jaken who is crazed out of his mind with fear and worry as she continues to think: I will let him worry, serves him right for taking his attention off of them, besides his panic and agitation amuses me. Nephra and Zephra stand near by before they begin walking, the domain they are in is beautiful but completely surrounded in greenery causing them difficulty in seeing ahead of them, they decide to follow the only dirt path that is in front of them. Nephra looks around as she feels something is lurking but there is nothing around except leaves, trees and plants. She knows someone or something is there; she turns around swiftly to see behind her, she sees nothing but her moment of observing her surroundings allowed Zephra to exceed her in steps. As she goes to catch up with her sister she is suddenly blocked by a giant, man eating, demonic Venus fly trap plant. 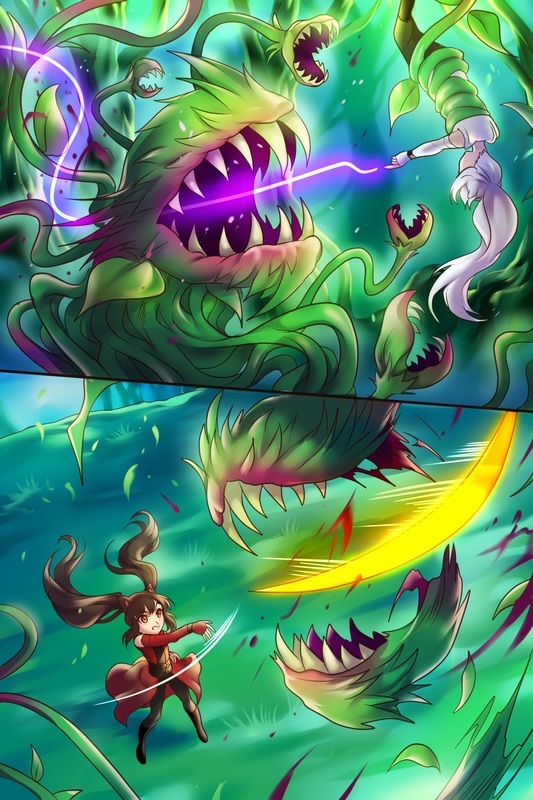 Nephra screams at the sight of it as the huge plant instantly grabs her by the leg, flipping her upside down and guiding her directly into it's mouth. As she is dangling there above the mouth of the plant, Nephra uses her finger whip to strike it in the mouth and her whip goes right through and out it's neck causing the plant to feel some pain but not enough to stop it from trying to devour her. Nephra has another idea but before she is able to do any other movements, Zephra is already on the job as she uses her slash blades to decapitate the plant. Nephra breaks loose but the plant is still not dead from it's head being cut off, Its head rolls around trying to catch them and the many arms are still very much alive as they come from all directions with the intent to twine them up with it's long stems. The girls jump and flip to avoid the head and arms, Nephra easily uses her claws to slash away at the stems while Zephra, also with no effort at all destroys the head by kicking it in the air like a ball and demolishing it with one swipe of her slash blades. The commotion is over with in mere moments. Jaken and Sesshomaru's mother are able to see everything as Jaken releases a strong sigh of relief, "Whoooo, thank goodness that's over." Sesshomaru's mother replies, "They handled the man eating plant with absolutely no difficulty at all, however this is just the beginning, there will be much more strenuous challenges ahead. I am certainly interested in seeing more of how well my granddaughters handle themselves in such situations." Jaken yells out, "Milady!! We should be trying to get them out not observing their skills!!" she responds, "Little demon, it was your negligence that allowed them to become trapped in one of my portals. Now we can only watch and hope that all goes well." Jaken is shocked and speechless as he stands frozen with his mouth opened wide, he knows she's right. If he had been paying attention this may not have happened. Meanwhile, the girls continue on their journey seeking out the amethyst gem as they walk the path they notice a rustling in the bushes, Nephra states, "It smells like some type of animal." They stop walking and are on guard as a giant brown bear leaps out and begins running toward them at top speed, it's teeth and claws are large and sharp, it charges at the girls and they both speed step out of it's way. The bear is not demonic so it is confused when it sees the girls move at such a fast speed but the bear continues it's attack on the girls as it charges them again and leaps forward with its claws pointing out in their direction. Zephra dodges the bear's leap at her by rolling in a ball underneath him swiftly, when the bear lands Nephra appears in front of it and gives it a good lash in the face with her whip. The bear yells out in pain and is now angry as it tries to swipe at her with it's claws but Nephra is faster, jumping backwards out of the way. Before the bear can make another move, Zephra uses a strong stick from the ground and begins to fight the bear with it, striking it hard. The bear is able to chomp down on the stick with it's teeth breaking it. Zephra throws the remaining stick piece that is in her hand at the bear striking it directly in the eye causing the bear to stumble a bit. Nephra uses her demonic blast at that moment and the bear falls to the ground from the force of it. Realizing that the girls are too powerful for it, the bear runs off down the same path they were following, The girls run after the bear as they see it run into a nearby area full of bushes. The girls can see that the bear is trying to hide from them and is huddled up with some little cubs. Zephra not really paying attention to the cubs says, "C'mon Nephra let's get it." Nephra responds, "Aw, She's a mother bear." Zephra replies, "So, she didn't care about that when she attacked us." Nephra explains, "We are strangers in her domain, she was only trying to protect her cubs." She pulls Zephra by the hand, "C'mon let's keep focused on why we came in here." Their grandmother watches on as she states, "It would seem that Nephra possesses the heart of her human mother while Zephra contains the coldness of a true demon." Jaken replies, "Yes, Milady, aside from her physical appearance, Zephra is much like her father." The girls continue walking when they see an apple tree near by Nephra is so happy to see it, that she runs to pick a big red one. She plucks it and examines it as she says, "It looks okay." she goes to take a bite and Zephra stops her, "NO Nephra!!" Nephra asks, "Why not? I'm hungry...I didn't get a chance to eat anything from grandmother's garden." Zephra responds, "Do you really want to eat anything in this forest? grandmother said it's dangerous here, get rid of it." Nephra agrees as they continue walking and she tosses the apple behind her shoulder, when it hits the ground it explodes causing smoke and a hole in the ground. Nephra and Zephra look back at the explosion and then at each other as they both think: That could have been bad. They continue walking on and see a huge lake that they must now swim to get across to the other side and continue on the path. Nephra asks, "So now what Zephra? Are we really going to swim this huge lake to get a gem?" Zephra stares at the lake and thinks for a minute, "Hey what if we use your whips to swing across it?" Nephra gives her a look, " That's not gonna work." Zephra and Nephra try to think of a way to get across the large lake but as they are thinking a huge wave begins to form, the girls are not paying attention as they are debating what to do and the wave covers over them and pulls them into the lake. The girls are very good swimmers as they stay afloat wondering what just happened. Before they realize it, the waves continue to come hitting the girls with much force. Nephra sees a tree with a long branch that hoovers over a section of the lake, she uses her finger whips, wrapping it around the tree branch to lift herself out of the water a bit. She calls out to Zephra, "Give me your hand." Zephra tries to swim over to her as the wave continues to hit her but she finally makes it over to her sister to grab her hand and Nephra contracts the whip to lift she and her sister further out of the lake. Zephra shouts out, "It was like the lake just tried to attack us." Nephra informs, "I think it was attacking us Zephra, it still is." The girls look and the water takes the shape of two monstrously large hands coming straight towards them. The girls scream as a hand grabs each of them separately. Nephra struggles a bit with the hand that has a hold of her tightly while Zephra slash blades the one that has a hold of her, when she does the water burst and splashes as she falls back into the lake. Nephra does the same with the hand that's holding her, destroying it with demonic blast and it also splashes as she falls into the water. The lake continues to attack them with hard, strong waves hitting them or a hand grabbing them. The lake begins to create water balls and throws it at the girls as they slash at them with their claws causing them to burst and reappear. The girls become frustrated because there seems to be no way to defeat this demonic lake. The lake begins to create a whirlpool. 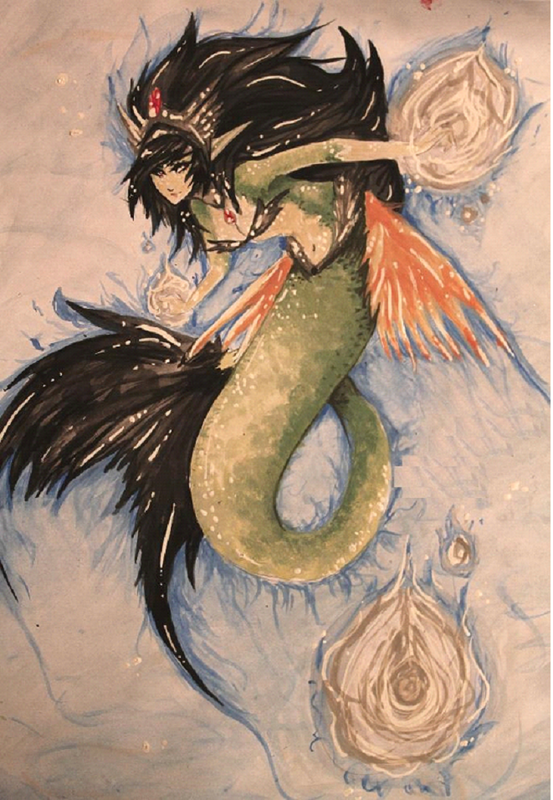 At first Nephra and Zephra tries to swim against it to avoid sinking as Zephra says, "We need to get out of this lake." but then Nephra realizes something as she shouts out to her sister, "Zephra, we should let it take us down!!" Zephra is confused as she inquires, "WHAT!! That's crazy!" Nephra explains, "I think something is controlling this lake, causing it to attack us, it's probably deep in the water." They agree not to resist the whirlpool and let it pull them down to the depths and when they go deeper into the lake they see that Nephra was correct, there is indeed a mermaid demon with dark hair controlling the movements of the lake causing it to attack. The girls are in the water now and as demons, they can breathe for a good amount of time but still need to go back up for air, the girls attempt to fight the mermaid as she is creating water balls and throwing them at the girls. The water balls are powerful blasts of demonic energy coming at them from under the water so they try to avoid the strikes as they attack the mermaid. The girls grab hands and swim together back up to the surface and both take a deep breath. Zephra instructs, "I'll go down next, give me a few moments then you come down to take my place in the fight so that I can come back up and take a breath of air, then I'll do the same for you. We have to take turns like that to defeat this under water demon." Nephra understands the plan as Zephra takes another deep breath and goes back down for the attack. After a few moments, Nephra goes down to relieve her sister. They continue on like that taking turns fighting the mermaid underwater and taking breathes until she is defeated with their demonic powers. The water becomes calm and the girls both go back underwater together noticing another opening or portal on the floor of the lake. Nephra points at the opening and looks at Zephra, they both swim as fast as they can toward it and go directly through it. They are back on dry land in another part of the domain of flora. Sesshomaru's mother is very impressed, "How clever they both are, it was very wise to allow the whirlpool to take them down. Taking turns attacking the demon was a most ingenious plan. Anyone else would try to struggle out of a situation such as that." Jaken asks, "OH, how much longer will this dreadful mission go on?" Sesshomaru's mother responds, "To my surprise, they have found the other gateway already. They are now very close to finding the gem they seek." Zephra and Nephra continue walking now that they are back on dry land, Zephra is excited as she tells her sister, "We are getting close to finding that gem, I can feel it." Nephra complains, "I hope so, we've spent our entire visit with grandmother fighting off demons." They continue following the path. As they walk a while further the forest begins to narrow and up ahead it seem to get dark, almost like a cave but they can see a fantastic glow coming from the area. It is a glow eliminating from the amethyst crystal it is much bigger than the girls imagined it would be but there are small gems and crystals all around it. They run up to it and both girls think that the scene is absolutely breathe taking, better than they could have dreamed as Nephra says, "It's amazing but huge." Zephra informs, "That's okay, we will take the smaller ones that we can carry and look..... there are some beautiful gold pieces all around also." The girls begin collecting what they can as their grandmother watches on unbeknownst to them, she thinks: Take all that you can girls, you have earned your reward. As they collect the gems and gold pieces that they like, they can hear the heavy footsteps of a very large being coming in their direction. Zephra says, "Oh, now what. I really don't want to be interrupted right now." A demon made of stone and more large than any the girls have ever seen is approaching them as it speaks to them in a very deep, demonic voice , "You are in a private domain, you may not take these precious jewels." Zephra stands and replies, "This domain belongs to our grandmother, A great dog demon, this is her territory and she has allowed us to take what we wish!" The demon replies, "The queen dog demon would not have half breeds as granddaughters." Zephra replies again, "Well she does, and you'd better watch what you say, we can easily end your pathetic life." Nephra adds, "Just let us take what we need and we will be on our way, your life can be spared." Sesshomaru's mother listens as she says, "They are so confident in their abilities, they seem to have no fear of this beastly demon at all." Jaken replies, "Of course not, They are the daughters of my powerful master, Lord Sesshomaru....... They fear nothing." The demon laughs at their threats as he says, "Do you really think killing me will be so easy? I will enjoy two half human girls for my dinner tonight." The demon opens his mouth very wide showing off his extremely large, sharp teeth as he snaps down at them, Nephra and Zephra dodge him by jumping out of the way. He shoots out stones from his mouth as Zephra uses multiple slash blades at fast speeds to destroy the powerful stones, Nephra uses her thick demonic whips to break the stones. As one of the stones flies towards Nephra she allows her demonic whip to wrap around it and she then swings it around like a sling shot, using it as her weapon as she flings it at the stone demon, it hits him between the eyes as he stumbles a bit but says, "You will have to do better than that!!" The girls try to attack the demon but the stone he is made of is much too strong and they are unable to cause a crack in his body or inflict any harm on him at all. Nephra yells to her sister, "He's impossible to kill, Zephra. What should we do?" Zephra replies, "Just keep striking his face and head, it's the only thing not covered in stone." The demon opens it's mouth again very wide to try and devour Zephra, she speed steps out of the way but when his mouth was opened she noticed that his insides were as soft and normal as any other demon or person. Nephra continues to fight him when Zephra decides to put her plan in motion, She times it perfectly, allowing the demon to aim towards her again. As he bends down, attempting to bite Zephra she scratches him in the face using her poison claws. The demon screams from the horrible pain of the poison and as his mouth is open from his screaming Zephra takes the opportunity to jump directly into his mouth. Nephra is shocked as she wonders why her sister did that. She is confused by what just happened. Sesshomaru's mother is also confused as Jaken yells, "AHHH, she's been eaten, What'll we do??!!" Sesshomaru mother replies, "She must have a good reason for her actions, be patient and wait little demon." With in moments, the demon begins to make a face that indicates he is in even more horrible pain and he suddenly bursts, stones and all go flying as Zephra has destroyed his heart using her slash blades from the inside of his body. The demon is completely destroyed as Zephra is perfectly fine and standing in the middle of all the mess from the insides of the demon. She says, "Yuck, That was disgusting." as she tries to wipe her clothes and face. Nephra responds, "That was great Zephra, You defeated him!" Zephra replies, "Yeah, but now I'm a mess. C'mon let's get the gems and go." The girls grab the gems and gold pieces as they continue forward trying to find there way out. Straight ahead they see a tree with demon fruit on it that looks exactly like the fruit tree in their grandmother's garden and Nephra says happily, "Zephra I think we may be back in grandmother's garden look!" They look ahead and can see more of the trees and demon vegetables, they see Jaken and their grandmother coming in their direction. They are both so happy they run up to Jaken and their grandmother as Zephra says, "See grandmother, I told you Nephra and I could do it." Their grandmother replies, "You certainly have proven me wrong. It seems I didn't even need to use my demonic scepter to bring you back as I thought I would." Jaken asks, "Demonic scepter? What is that Milady?" She snaps her fingers and a long scepter appears in her hand as she explains, "I would have brought the girls back to the garden in an instant with this scepter if they had been hurt or in any real danger but I did not need to use it after all." Jaken yells out, "WHAATT!!" he faints from the anxiety that he had to endure for no reason at all. Nephra and Zephra's grandmother tells each of them, "Nephra, you are intelligent, skilled in fighting and you have the beautiful appearance of our clan. I am very proud of you." Sesshomaru's mother tells Zephra, "You are courageous, extremely clever and a true dog demon at heart. Though you resemble your human mother, I am most happy that you are my granddaughter. You are both my pride and joy." They hug their grandmother as she takes them to a nice lunch before they must head back home. When they arrive back at their own castle, Rin and Sesshomaru are at the throne area. Rin is very happy to see the girls are back as she asks them, "How was your visit?" Nephra informs, "It was like an adventure, grandmother gave both of us these beautiful amethyst crystals." Zephra says, "It was so much fun, I can't wait to go back." Jaken again replies, "HUH??? GO BACK??" he faints again at the thought of another visit like that one. Rin and Sesshomaru look at Jaken wondering what could have caused him to react that way.